On Friday’s Breitbart News Daily, SiriusXM host Alex Marlow spoke with Ann Coulter, author of In Trump We Trust: E Pluribus Awesome! and Adios, America: The Left’s Plan to Turn Our Country into a Third World Hellhole. “As I write in In Trump We Trust, at some point, if you could bring back 50 prominent individuals – you know, U.N. officials, presidents, cabinet secretaries, important and significant journalists, take them out of cryogenics and set them loose in America, saying there’s been signs of a new uprising of a Nazi movement, we just want to send you out, you go find it someplace. It’s the Left where you would find it. It is the women’s march. It is what happened at Berkeley. It is all of these Trump supporters being beaten up during the campaign at the Trump rallies. They really are animals, and I think there are probably millions of Americans who didn’t vote for Trump for a variety of reasons: they’re Democrats, they wanted the first woman president, they thought Trump seemed a little wild, and they’re sitting back thinking, ‘Oh, my gosh, I’m glad these other people didn’t win,’” she said. Coulter shared Marlow’s amusement at NeverTrump conservatives, who vowed during the campaign to prevent Trump from winning the presidency, celebrating his choice of Neil Gorsuch for the Supreme Court – a name taken directly from the list of possible nominees Trump announced during his campaign. She added that one of the “strangest” claims made by NeverTrump during the campaign was their insistence that Trump would not build the promised border wall. “I guess I can’t laugh and sneer about that yet, but even one of my emotionally NeverTrump friends – and I don’t have many; I don’t know what’s gotten into him, but he has a high IQ, so this isn’t coming from a fan – he kept emailing and saying, ‘I don’t understand. The wall is the simplest of Trump’s promises. He’s a developer,’” she recalled. “Usually, people are saying, ‘I’m going to fix the economy and bring back jobs. We’re going to have peace, prosperity. Oh, no, those are promises everybody’s going to fill, but building a wall? It’s a very simple thing. Getting Mexico to pay for it, we can take it right out of – I mean, not that anyone particularly cares, a wall is worth every penny at any price – but you could take it out of Mexico’s foreign aid, as I suggest in Adios America,” she said. “I gotta tell you, I don’t think it’s worth the American taxpayers’ money to try to distinguish the Christians from the non-Christians. All of these refugee and asylee cases are riven with fraud, just shocking amounts of fraud. I have a chapter on it in Adios America,” she said. Grading President Trump’s first two weeks in office, Coulter said, “I give him an A+++.” However, she agreed with Marlow’s point that Trump should lay the groundwork for dramatic decisions like his executive order on immigration, walking the American people through the logic of the order, rather than suddenly implementing it and dealing with criticism afterward. “When you have the entire media hysterically opposed to Trump, and their idea of giving the other side is, you know, Meghan McCain or Charlie Sykes…no, they won’t put on anyone who can articulately defend Donald Trump or explain Donald Trump, which is, by the way, why they were all sitting back, popping champagne, waiting for Hillary to win on election night,” she scoffed. Coulter said she would not waste time refuting smears like House Minority Leader Nancy Pelosi’s accusation of “white nationalism” against White House strategist and former Breitbart News Daily host Steve Bannon. “I think the only appropriate response to something like that is laughter,” she advised. “Let Nancy Pelosi prove she’s not a space alien. Perhaps Breitbart should exclusively refer to her, maybe have a breaking news story about her being a space alien”: THIS IS A BREITBART NEWS ALERT: We interrupt this radio interview transcript to report on allegations from unnamed sources that House Minority Leader Nancy Pelosi may be of extraterrestrial origin. We can confirm at this time that one of our sources is a best-selling author. We now return to our interview with Ann Coulter. Having given President Trump high marks for his first days in office, Coulter professed disappointment with congressional Republicans’ efforts to repeal and replace Obamacare. “Part two is all the Washington lingo they use, like ‘portability. We need portability!’ What I loved about Trump at these debates – the very first debate, which I describe in the book, he says, ‘You gotta be able to buy insurance across state lines. It’s crazy.’ I mean, he even said it in that wacky, ungrammatical way he has, which is apparently eminently understandable to millions upon millions of Americans but leaves people like you and me sometimes scratching our heads. But I mean, I understood what he was saying. He’s talking about buying insurance across state lines. All the other Republicans on the stage didn’t understand what he was talking about,” she said. “That’s all it is, Alex. We just want the free market applied to health insurance, and forget about boring us with your sob-story cases. Okay, some of them are genuine sob stories; I don’t mean to be unkind about that, but it’s a tiny, tiny, tiny minority of people who just happen to have kids or they themselves are born with some horrible condition. Just let me buy it on the free market the same way I buy shoes, and books, and milk, and, by the way, car insurance, renters’ insurance, homeowners’ insurance,” Coulter exclaimed. “I also love something what Trump got attacked for in the debates, which I also describe in In Trump We Trust: he said there are three categories. There are 319 million people in the country in the category you were just describing: ‘Please just let us buy this product,’ which is now illegal in America, to purchase. That’s the letter I got. My insurance, made illegal,” she said. “Anyway, that’s 319 million. Then there are a few million who are incompetent, lazy, they won’t have health insurance. Okay, as Trump said in the debates, we’ll take care of them on a different system. Maybe it’s Medicaid for all of them. Maybe they’re poor, they’re young, they’re millennials. Whatever it is, we’re not going to let people die in the street – a sentence that both Ted Cruz and Rand Paul attacked Trump for. 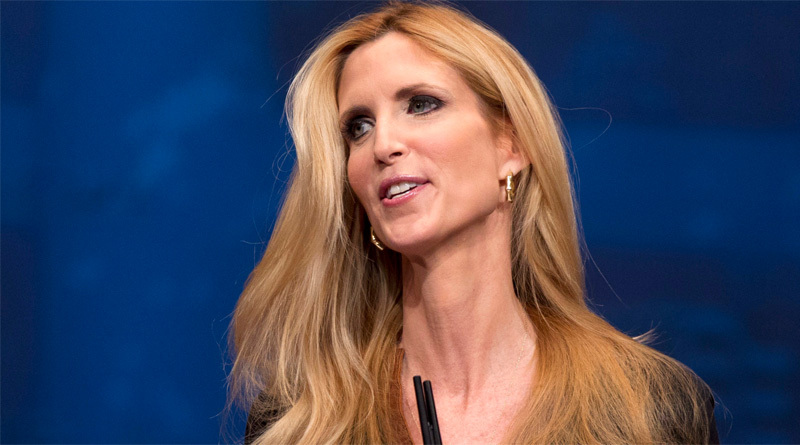 Of course, we’re going to let people die in the street, but you don’t have to wreck Ann’s health care to take care of them,” Coulter asserted. “And then the third category, which is the tiniest category of all, are people who just got a band hand in life. We’re happy to help someone who was born with some genetic condition. That’s separate. We’ll pay for them. We could give them all $10 million, and it would be cheaper than the current Obamacare,” she said. Marlow comically feigned surprise when Coulter said the top issue for people on the Right to be engaged in now, and where they can expect the biggest fight, is immigration. “Obviously, because who gets to live and vote here and collect Social Security and housing aid, obviously, is the most important issue. Look at what happened in your state, California,” she told Marlow. “So for one thing, this is the Democratic Party fighting for its life. If they don’t get to keep bringing in Third Worlders – and I ought to say, since 1970 we’ve been bringing in more than a million immigrants a year, 90 percent are from the Third World, and post-1970 immigrants are voting 8 to 2 for the Democrats. This isn’t some wild speculation on my part. That is what has happened. It’s what happened to your state, California, the state that gave us President Nixon and President Reagan. We’ll never elect a Republican statewide. Soon that will be the entire country,” Coulter predicted. “And it’s not just building a wall and not even letting in one more immigrant. Simply through the process of the Third World immigrants already here – some of whom are lovely, glad to have ya, but if you’re not here legally, or if we don’t have to bring you in because you’re just coming for cheap health care, not a good idea – just through the process of the post-1970 immigrants already here turning eighteen, Trump loses in four years under the exact same conditions, the exact same election! Because you look at those, what is it, seven swing states – Pennsylvania was a huge win, but the rest of them were pretty much 47-48,” she noted. Coulter took a dim view of the Left’s political theory of universal American guilt, which she lamented too many Republicans have been bullied into embracing. She said she could understand talk of lingering collective guilt over the “legacy of slavery” to black Americans but found it absurd to hold America responsible for grim conditions across the Third World, especially when the United States has been so generous with foreign aid and disaster relief. She also strongly rejected the notion that Americans are so guilty and culturally inferior that they lack the standing to criticize the Left’s preferred victim groups. “I’m absolutely, positively thrilled. It looks like he is going to keep all the promises. I’m so happy we elected a workaholic, a germophobic, and a cheap Scot,” she proclaimed. Speaking of Supreme Court nominees, wouldn’t it be glorious to see Ann Coulter on the SCOTUS? Here’s a woman who is as conservative as Phyllis Schlafly, while being equally courageous and brilliant.